Have you ever read a commentary on a passage in the New Testament that involves a textual variant, and you say, “Hmm; let’s see what this other commentator says,” and the other commentator says almost the exact same thing? It’s as if one of them borrowed the other writer’s words, or as if they are slightly rephrasing what was written by an earlier author. For example, consider what Bart Ehrman wrote in Misquoting Jesus (also published as Whose Word Is It?) on page 48, where the author is illustrating scriptio continua – but can’t spell the jargon – and uses the example, “lastnightatdinnerisawabundanceonthetable” – and you think, “That sounds a lot like what J. Harold Greenlee wrote on page 62 of Scribes, Scrolls, and Scripture. What an amazing coincidence! And one could also compare Metzger & Ehrman’s The Text of the New Testament, in the 2005 edition, and notice that their description of minuscule 33 is rather similar to the description given by Kirsopp Lake, a prominent scholar of the previous generation, in his book called The Text of the New Testament. And one could notice that in both books, minuscule 1739 is “of extreme importance,” and in both books, minuscule 565 is “one of the most beautiful of all known manuscripts,” and in both books, 579’s text is “extremely good,” and other remarkable similarities. Does this sort of thing still happen? And, are there cases where errors have been perpetuated in this way? Let’s look at what Dr. Norman Geisler, a leading evangelical apologist, wrote about Mark 16:9-20. His statements are still circulated online at the Defending Inerrancy website. This is typical of many commentaries which are echoing Bruce Metzger, who wrote that the ancient manuscripts Vaticanus and Sinaiticus, and one Old Latin manuscript (Codex Bobbiensis), one Syriac manuscript (the Sinaitic Syriac), many Armenian manuscripts, two Georgian manuscripts, “and a number of manuscripts of the Ethiopic version” do not contain Mark 16:9-20. Geisler has merely blurred the data that he got from Metzger – and in the process he turned two manuscripts into “many,” as well as obscuring the important detail that he is referring to minute minorities of Latin and Syriac manuscripts. Geisler also has failed to update his description of Ethiopic evidence. In 1980, Metzger released the article The Gospel of St. Mark in Ethiopic Manuscripts, in New Testament Tools & Studies, Volume X of New Testament Studies – Philological, Versional, and Patristic. In that article, Metzger retracted his earlier claim and concluded that all existing Ethiopic manuscripts of Mark 16 include verses 9-20. Metzger mentioned this material in a footnote in his Textual Commentary. Unfortunately Geisler never got that information, and no one has told him, so he is still teaching his readers a false claim about the Ethiopic manuscripts. This sort of mistake can be observed in a tall stack of commentaries which are nothing but echoes of Metzger where text-critical subjects are concerned. The authors did not want to plagiarize, so they took all kinds of liberties in their descriptions of the evidence. The resultant mess is not quite as misleading as those times when Bart Ehrman claimed that the story of the adulteress (John 7:53-8:11) originated in the Middle Ages, but it’s still pretty bad. Once again, Geisler is performing reverse ventriloquism. The first edition of Metzger’s influential handbook The Text of the New Testament was the basis for those two sentences. Metzger wrote: “Clement of Alexandria, Origen, and Eusebius show no knowledge of the existence of these verses; other Church Fathers state that the section is absent from Greek copies known to them (e.g., Jerome, Epist. cxx. 3, ad Hedibiam, “almost all the Greek copies do not have this concluding portion”). 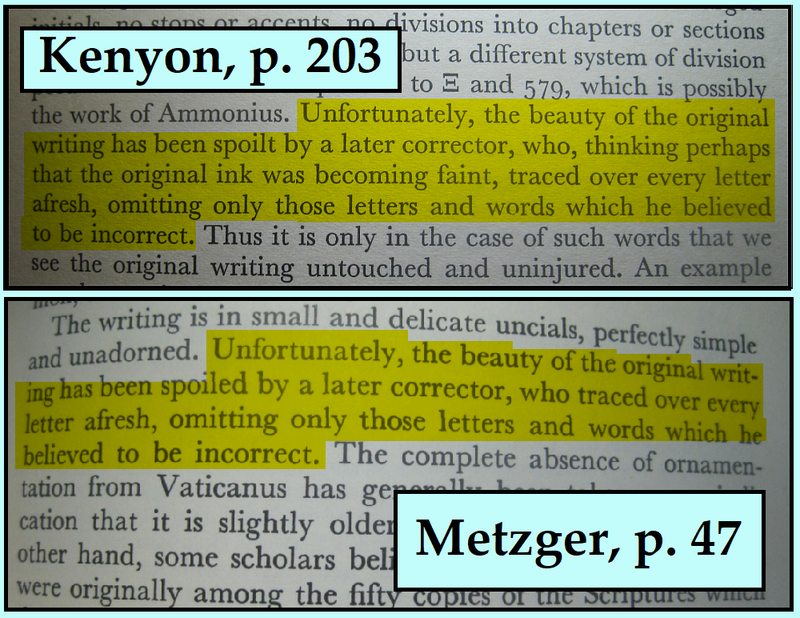 Unfortunately Geisler is uninformed about the corrections that Metzger made in later editions. After erroneously stating that Eusebius shows no awareness of Mark 16:9-20, Metzger realized his mistake and quietly adjusted the sentence in the later editions of his book, removing the name “Eusebius.” Yet the Defending Inerrancy website promoted by Geisler (and others) is still spreading an error about Mark 16:9-20 and Eusebius, even though the Greek text of Eusebius’ composition Ad Marinum, in which Eusebius uses Mark 16:9 several times, is now available with an English translation. This claim is based on Metzger’s statement that “In other witnesses the passage is marked with asterisks or obeli, the conventional sigla used by scribes to indicate a spurious addition to a literary document.” But has anyone ever tried to list those “many manuscripts” that allegedly have special marks by Mark 16:9-20 to signify that the passage is spurious? More on that in a minute. I have researched the ending of Mark in detail, and my position is that these twelve verses were in the text when the Gospel of Mark first began to be copied and circulated for church-use. Most of what Metzger wrote about this passage is remarkably vague and selective. His comments need significant clarification and supplementation, and when that is provided, the text-critical contest looks very different. But my purpose today is not to show that Mark 16:9-20 is genuine Scripture; I’ve already written about that. My point is that when text-critical subjects such as Mark 16:9-20 and John 7:53-8:11 are involved, most commentators are basically parrots, not independent researchers. I am sad to say that this is especially true of evangelical commentators. The failure of their fellow scholars to correct the inaccurate text-critical claims in commentaries and in books written by apologists is evidence that either their peers do not care about the subject, or else are themselves equally oblivious to the facts of the case. When commentators perpetuate another author’s mistakes like this, it is almost impossible to undo the damage. 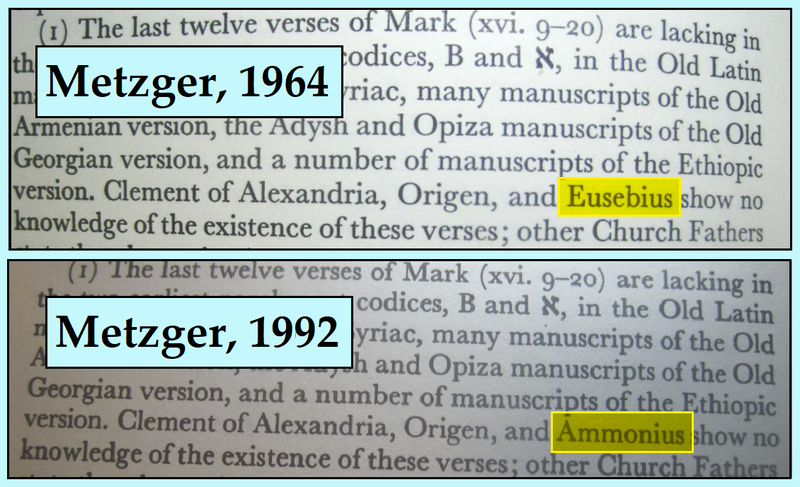 Metzger’s false claim that some Ethiopic manuscripts end the text of Mark at verse 8 is still being spread not only by Norman Geisler but also by Matt Slick at the CARM website, and by James White at the Alpha & Omega Ministries website. And in the fourth (2005) edition of Metzger’s handbook, The Text of the New Testament, co-edited by Bart Ehrman, even though on page 120 it mentions that Metzger showed that all known Ethiopic manuscripts of Mark 16 support verses 9 through 20, on page 322 of the very same book, there’s the claim that “a number of manuscripts of the Ethiopic version” omit verses 9-20! Commentators such as Larry Richards, who claims that “many ancient Greek manuscripts” end Mark’s Gospel at 16:8, could not name any of them except for Vaticanus, Sinaiticus, and minuscule 304 – because there aren’t any more than those three. 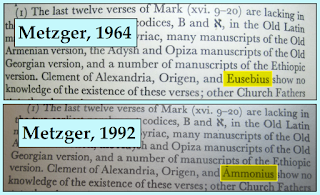 Writers such as N. T. Wright and Craig Evans, who claim that “a good many of the manuscripts” or “Many of the older manuscripts” have asterisks alongside Mark 16:9-20 to indicate that the passage is doubtful, could not name those manuscripts if their lives depended on it – because there aren’t any. (Dan Wallace attempted to list them and that was an epic fail. Two small groups of manuscripts have special notes accompanying the passage, but the closest that any Greek manuscript comes to simply having an asterisk is minuscule 138, which has an asterisk in the margin, but that manuscript has the usual catena-comment on the passage, and the asterisk is just a proxy for a Eusebian section-number.) 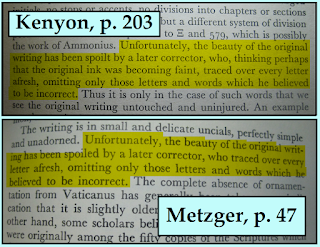 And writers such as Ben Witherington III mislead their readers with false claims about Eusebius and Jerome – because the writers did not consult the patristic writings directly, and instead just digested what Metzger wrote, and regurgitated it, all mixed up, into their readers’ laps. But these commentators were not liars. They were sloppy, lazy parrots who depended on obsolete resources. Evangelical commentators and apologists have a text-critical parrot problem. Let the reader beware. James, thank you for your research and commentary on this problem. We would not be aware of such unless you pointed it out. Great Article! It's surprising that such learned and respected men can propagate such obvious error. I did a presentation a while back about the NT Canon, and was almost shocked with how many people thought the 1st council of Nicaea created the canon, even among the more studied people in our church! What interests me here is the lack of semantic precision in the use of the word “some”. The first time it means “three”. The second time it means “six”. The third time it means “about 1,700”! You've got enough material for a book. I have not read enough to know what I think about this topic, but it seems to me adding the information 3, vs 6, vs 1,700 manuscripts is not that much more helpful Whether you use numbers, or the word "some", there is no ability for the reader to make a judgement regarding each of the options. In fact printing the numbers may even be deceptive, as it may lead the reader to believe that total number of copies is of primary importance in evaluating the endings. While we are on the topic of Mark endings, it seems like ya'll have widely read on this, what did you think of how this book deals with the endings?